Setup Welcome dialog Installation packages / Click on "Next" Select/enter installtion path / Click on "Finish" Installation summary / Click on "Click here to view important installation notes"
This dialog window provides important information about the installation. If the system requirements for Intrexx are not met, you will be notified of that here. ImageMagick will be used to increase performance when images are scaled, for instance in an Intrexx image gallery. You can find additional information on this topic in the documentation from ImageMagick. 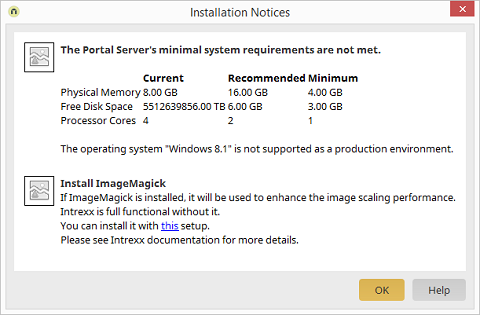 Please always use the latest version of ImageMagick for Intrexx Version 18.09. Closes the dialog. You will be returned to the installation summary dialog. Opens the help for the current dialog.